I am eagerly anticipating this decision as I sit here writing this......... I found out this morning that the panel from Williams-Sonoma that approves products won't be able to look at mine until the 23rd. So I get two more weeks to sweat it out! Ahhhhh........Oh well, that's ok, that's life right. I am just so honored to be considered and scared out of my mind at the thought. 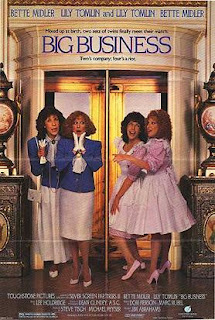 I always loved that movie from 1988 called "Big Business" with Bette Midler. It was my favorite movie for the longest time, and I have seen it at least 20 times. She was so in control and funny, the big business lady that she was. And I kept telling my parents I wanted to be a big business woman, and here I am today sitting in a tiny office trying to make that come true. After all these years I really just wanted to stay in good old Lodi and be with my family, work with kids, and sing. And now, I am self employed and trying to make it in "big" business. So funny how life works and what God brings to the table. You've seen that movie way more than 20 times! I had to watch it with you and you had it memorized, lol. Don't sweat it. It will go by faster than you expect. Just so exciting...you have worked hard to create something beautiful and unique!